Astronaut Leland Melvin didn’t have a straight trajectory into the NASA astronaut program. He grew up as a nerdy kid in Lynchburg, Virginia, interested in science and sports. After college, he was drafted into the National Football League. But when injuries sidelined him, he pursued his other interest and became an engineer at NASA. Melvin would eventually make it through the NASA astronaut program and onto two missions to the International Space Station. He also authored a book, “Chasing Space: An Astronaut’s Story of Grit, Grace, and Second Chances.” He joins Ira to talk about the different stops on his journey, and the groups and communities that supported him. Leland Melvin is a former NASA astronaut and the author of Chasing Space: An Astronaut’s Story of Grit, Grace, and Second Chances (Amistad, 2017). He’s based in Lynchburg, Virginia. IRA FLATOW: This is Science Friday. I’m Ira Flatow. Most people have a couple of different jobs in their career. Well, before I was in radio, I flipped burgers, I sold men’s clothing, I worked in a factory. But our next guest has really tried out all kinds of professions. He was drafted as a wide receiver in the NFL. From there, he went on to become a materials science engineer. Finally, he became an astronaut with two missions to the International Space Station. Now he’s an author and an educator. So what do a football player and an astronaut have in common? And how do you get to do two of the dream jobs of thousands of kids? My next guest is here to tell us about his journey. Leland Melvin is a former NASA astronaut, author of the new book Chasing Space, an Astronaut’s Story of Grit, Grace, and Second Chances. He joins us here in our [INAUDIBLE] studio. Welcome to Science Friday. LELAND MELVIN: Great to be here, Ira. IRA FLATOW: Nice to have you here. I’ve discovered in reading your book, we have two things in common. I said before, one. We have two things in common. One is we both almost burned down our mother’s house. Tell us about what you did there. LELAND MELVIN: You know, my mom gave me this age-inappropriate non-OSHA certified chemistry set back in the day when you could have things that blow up. And I mixed these two chemicals together. I can’t remember what it was, but it created this explosion, I burned her carpet, she ran in the room. And, you know, I got a spanking. But my brain was activated to science because I was a scientist at that point. And it was one of those moments where, you know, I became a chemistry major in college because of that one experiential moment in my life. IRA FLATOW: Was your mother influential in any of that? LELAND MELVIN: Yeah. I mean, she gave me cameras, and I set up a dark room in her basement, and all these little experiential things to do outside of the classroom. And those were the things that really got me geeked about science. IRA FLATOW: You– I mentioned all the different things you’ve done. But one of the things you mention in your book is the chance for a second chance in life. How important was that? LELAND MELVIN: It’s extremely important. I mean, I remember dropping this touchdown pass in the end zone at my homecoming game my senior year. And I went to the sideline, waiting to be slammed down on the bench. And my coach said, I believe in you. Go back out there and catch the ball. And so we ran the exact same play. And this time I’m in the end zone to catch the ball, the scout that was walking out of the stadium after I dropped the first pass, turned around and saw me in the end zone doing a little dance. And he said, maybe this guy can play for us. And so that one catch resulted in a $180,000 scholarship to the University of Richmond. And I was ready to sit on the bench. I was embarrassed. My friends were there. And so we all have people that know better than we do that we can still perform after such horrific failure. IRA FLATOW: So what put you on the road to becoming an astronaut? IRA FLATOW: Legendary John Young. LELAND MELVIN: Legendary. I mean, he’s flown every vehicle, walked on the moon, Columbus– you know, Columbia, STS1. And so if John Young says well, you should apply, maybe, you know, maybe you should apply. IRA FLATOW: He used to fly– before the shuttle was launched, he used to fly down the range to see if everything was clear [INAUDIBLE]. IRA FLATOW: He was a legend. There’s the idea that you’re either a jock or a nerd. Right? The stereotype, but you seem to have melded both of them together. LELAND MELVIN: Well, it’s funny. I was talking to someone the other day and they said that jocks are usually connected with nerds when they’re trying to get their homework done. Even though they don’t want to admit it, they’re kind of connected. But I mean, I had a school that was appreciative of me being able to be in calculus class, and then going to football practice. And even at the University of Richmond, before I signed my letter of intent, I asked a coach, I said, can I get a chemistry degree here and play football. And that means at a small school that I’m going to miss practice. And the two hard practices a week, I only practiced like for 15 minutes because I had chemistry lab. So they held to their end of the bargain. But you can do both if you’re given the time, the access, and the opportunities. IRA FLATOW: The dogs. There are two– what kind of dogs– licking your face, jumping up on you. How’d they get in the photo. You made sure they got in the photo. LELAND MELVIN: Well, NASA says when you take your official picture before you go fly in space that you can bring your family in. Now, my human family was in Virginia. But I had my dogs there in El Lago. And I– you know, they don’t allow dogs at NASA so I had to sneak them in through a van. And we came up the back stairs. And we got in there. And I had like about 100 milkbones that they were eating happily. And then I came out in my pumpkin suit. They ran over to me. I told the photographer, I said, start shooting. That’s the– kids and baby– you know, dogs and babies, you never know what they’re going to do. But when they came over, Jake was in my ear, Scout was looking– and if you look at the picture, all of us are holding hands. IRA FLATOW: Oh, that is true. 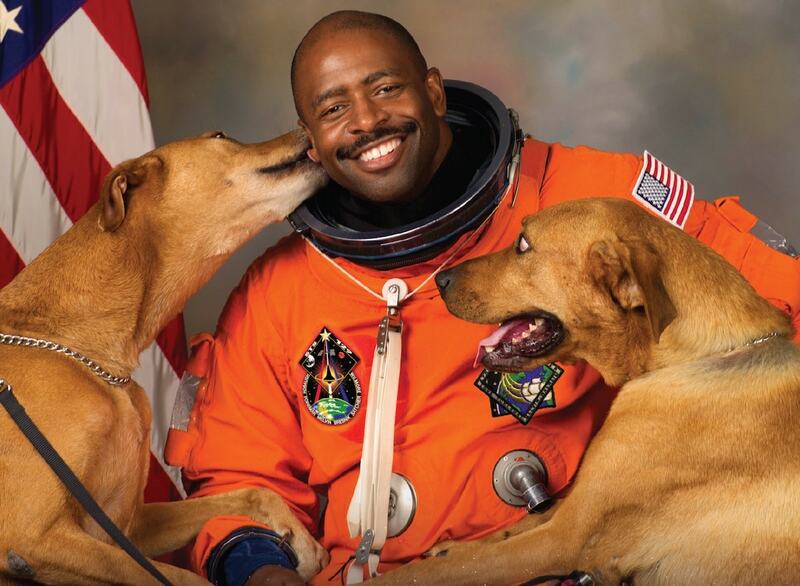 LELAND MELVIN: Two paws and a hand. IRA FLATOW: I see that. LELAND MELVIN: We were all connected. And that was– when I saw that, I’m like, yeah, that’s the shot. IRA FLATOW: Are they still around? LELAND MELVIN: No. They both passed. Had to put both of them down. We took trips. We actually took a trip up to Columbia Point where we honored the Columbia crew, up in the 14,000-foot mountain. We walked up there together. And so we had a lot of good memories, lot of good memories. IRA FLATOW: You have another dog? LELAND MELVIN: We’re getting more sometime soon. IRA FLATOW: All right. Let’s talk about Administrator Bolden, who used to be a regular guest on Science Friday. No longer. I used to always look forward to him. Because he was a real straight shooter. He would tell us exactly what’s going on. Did he have any influence on your career? LELAND MELVIN: He did. I mean, at the point that I was thinking about applying to become an astronaut, I remember I was up at NASA headquarters. And he was walking down the hall. And I said to him, I said, I’m thinking about applying to the astronaut corps. He said, well, you can’t get in unless you apply. You need to apply. And so he kind of put the nail in the coffin and convinced me to apply. But just such an incredible advocate for education and for helping inspire– you know, if you’re walking down the hall and there’s a kid there, it’ll be another 30 minutes before he gets to the meeting that he was supposed to go to, because he’s sitting there trying to get this kid inspired and motivated to believe in themselves and do anything they want to. And I just– I appreciate all of his efforts. Not just for running the space agency, but for that piece of education. LELAND MELVIN: Well, thank you. I’ve been listening to you all these years. LELAND MELVIN: No, seriously, though. I can’t believe I’m on Science Friday today. IRA FLATOW: I’m always so happy to have you on Science Friday. But I will– because you have met famous people I wish I had been. I’m going to go– you go through the book, you’re like dropping names all over the place. It’s just great because you’ve actually legitimately met them. And people who were not famous when you met them, like Hidden Figure’s Katherine Johnson. LELAND MELVIN: Katherine Johnson. She’s my she-ro. She is another she-ro. In 1989, I started working at NASA Langley. And she retired in ’86. And I remember we would go to these meetings, these National Technical Association meetings. And she was the treasurer and I was a member. But I never knew all the stories about what she had actually done. And when the movie came out, you know, you saw these– I was watching the movie with her. And whenever there was a piece of footage that something was like spot on, she would smile. And then when something was Hollywood-ized, she would like kind of frown or like shake her head, that didn’t happen. But just think– I saw her about a week ago. And I gave her a copy of Chasing Space. And she was really happy. And the blurb on the back where she was waiting to see a black man fly in space, which she has seen. And she had a friend who flew in space, too. So that was a big honor for me to give her my NASA flown pin. Because NASA had never given her the Silver Snoopy that we give to people to keep us safe. And so we retroactively gave her the Silver Snoopy. And I took my pin back. IRA FLATOW: All right. I’m going to say three things are in your book, another great story, I don’t want to screw it up. I’ll let you do it. And you tie them all together. OK? One, is going to be Star Trek, Whoopi Goldberg, and Martin Luther King Jr.
LELAND MELVIN: Whoopi. OK, I got Lieutenant Uhuru. IRA FLATOW: OK, let’s go there first. LELAND MELVIN: So Nichelle Nichols, who is this incredible credible person on Star Trek, the first African-American woman on television in the ’60s that was in a leadership role. And she was going to quit the show. And Gene Roddenberry brought her in. And had this great crew. And she was going to quit the show and go back to theater and dance. And she gave her resignation. He said, just think about it over the weekend. Over that weekend, she went to an NAACP meeting in LA. And this guy told her that her number one fan was right around the corner. So she walks around the corner, and it’s Dr. Martin Luther King Jr sitting there like a little kid, like looking at his star, his idolized star. And he tells, he says, Nichelle, you cannot quit this show, because you’re doing what I’m trying to do with the civil rights movement right now. And you and Gene and that cast, the first interracial kiss in the ’60s. The first intergalactic kiss also, when he kissed the green woman– captain Kirk kissed the green woman, right? And all this stuff going on when we have all this unrest in the south, the Freedom Riders getting bombed, and all these other things going on. And Star Trek on television is breaking all these boundaries. IRA FLATOW: She said, anybody could make it. LELAND MELVIN: Yeah, that’s right. That’s right. And so then NASA hired Nichelle Nichols to bring in the first women and minorities. So Sally Ride, Guy Bluford, Mae Jemison, all these people were kind of recruited through her efforts to inspire people that didn’t have white skin and crew cuts. Incredible. IRA FLATOW: Right Stuff folks. Our number is 844-724-8255. Let’s go to Northern Virginia. Let’s go to Alden High. Welcome to Science Friday. SPEAKER 1: –Ira. Sorry about that. First time caller, long time listener. I hope you guys are doing well. I’ve got a question, how do I spur interest in science, in space, in my preschool age son. He’s not yet four. IRA FLATOW: This is something right in your wheelhouse. LELAND MELVIN: Yeah, so you can take– well, in the back of Chasing Space, the Young Readers edition, we have STEM on the cheap. And we’re building rocket racers. We’re building rockets where you can actually make them out of very inexpensive materials, and these very fun activities. If you don’t want to buy the book, go to lelandmelvin.com, and we have built out a website that’s called STEAMography– Science, Technology, Engineering, Arts, and Mathematics and biographies combined. And there are similar experiments on there. But the main thing is to go outside at the night sky and watch the space station coming overhead, and knowing that there are five people up there. One of which is the first female commander of the International Space Station. And she was my commander when I was there. Now she’s going to be the longest running US astronaut– 650 days in space. So tell your children that this woman is up there doing these incredible things. And people from around the world are working together as one civilization– not fighting, not warring, but working together. And so the Space Station is a good thing to look at. And then just being curious. I mean, there’s so much stuff on the internet you can do end teach about science, and STEM, and space. IRA FLATOW: And we have Science Friday education site also. It’s got all kinds of great stuff and projects in it. I’m Ira Flatow. This is Science Friday from PRI, Public Radio International, talking with Leland Melvin who’s a great storyteller in his new book Chasing Space, an Astronaut’s Story of Grit, Grace, and Second Chances. We had astronaut Mike Massimino on the show a while back. We graduated the same high school. We lived about two blocks away and we didn’t know it. LELAND MELVIN: [INAUDIBLE] a bagel story. IRA FLATOW: Oh, is that right? He said one of the things that you can’t train for is all the emotions that you experience in space. What is it like? LELAND MELVIN: People try to tell you before you go to space, what you’re going to feel. And I told them to shut up, and I don’t want to hear your account of it. I wanted to feel it for the first time. You know, Ira, when I got to space, I undid my seatbelt, and things were floating around me. And I pushed off with my back. And I start floating toward the window. My job, at that point, was to grab a video camera and film the external tank falling back to the earth. And that was a witness play, if something had come off and hit one of the wings. IRA FLATOW: Do you think kids are the answer, working with kids? LELAND MELVIN: It’s inspiring them. It’s allowing them to dream so that they can have a dream of a future that’s inclusive and free of all these isms and things. And it starts with play. I mean, if you’re in school right now, you’re kind of getting taught to the test, to take a test, which is sometimes not attached to building and creating and exploring. And so if we can’t get that in school, maybe we need to get that at home or through community centers or Boys and Girls Clubs. There are other ways to get that. Like I built a bread truck with my dad. And he drove this Marita bread truck into our driveway. And I said, OK, he’s a schoolteacher. He’s a musician. Now he’s a bread truck driver. And he said, no, this is our camper. And over that summer, we repurposed that bread truck into bunk beds that flip down, that’s mechanical engineering. We plumbed a propane tank into a Coleman stove, chemical engineering. And we re-wired the whole van, electrical engineering. I was becoming an engineer and in sixth grade building a bread truck camper. IRA FLATOW: So you’re inspiration. I mean, you are sort of a mentor for kids. LELAND MELVIN: We all are. We all are. IRA FLATOW: You think all are. LELAND MELVIN: We all are. It’s just, are we good ones or bad ones? We all have an opportunity to light a child’s curiosity by just showing them something. And that light can go so far. And just believing in them. And giving them an opportunity. I think we sometimes– we have a– Angela Duckworth and Carol Dweck, we have a with a fixed mindset, where we focus down instead of letting kids know that they can be a mathematician and a jock. Or whatever it is. And just let their minds grow. IRA FLATOW: Did you say that there’s a kids edition of this book? IRA FLATOW: Well, what is it? How do we get ahold of it? LELAND MELVIN: So it’s Chasing Space, the Young Readers edition. And it’s for middle grade students, so maybe sixth grade through ninth grade. And it’s got the experiments in the back. You can get it at any of your booksellers that you go to. But it’s a lot of fun. IRA FLATOW: It’s a great book, Leland. When Leland Melvin, author of Chasing Space, an Astronaut’s Story of Grit, Grace, and Second Chances. Thank you for joining us today. LELAND MELVIN: Thank you, Ira. IRA FLATOW: It was so much having– it was great having you on here. Let’s tell our listeners that on our website, it’s sciencefriday.com/astronaut, they can read an excerpt from your book on there. Visit Leland Melvin’s website for kids. Astronaut Leland Melvin recounts daily life aboard the International Space Station, including a communal dinner, celebrating a birthday, and the challenges of trying to sleep in microgravity.